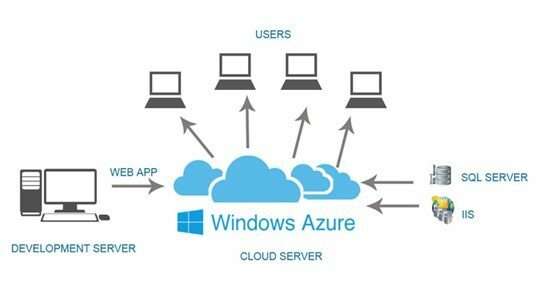 What is azure cloud application? Azure is a cloud computing service created for deploying, managing and building services and applications throughout a world network of managed data centers. It administers, platform as a service, infrastructure as a service and software as a service and supports numerous distinct programming frameworks, languages and tools. In the new era of the cloud computing the azure cloud as set a new benchmark. The flexible Azure cloud platform is designed for the modern business. It allows the medium and small sized businesses to manage, deploy and build applications by Microsoft’s global network of data centers. Cloud computing requires computing platform in the cloud, on which remote apps can run. Many cloud platforms are available from distinct vendors, including number, Amazon, IBM etc. Omkarsoft is one of the leading Azure Cloud application development company. When you choose Omkarsoft we promise in designing and building highly effective, outstanding apps with amazing interfaces with efficacy. One of the important advantage of azure cloud development is azure is windows based. It allows the developer to write applications based on the programming language used for windows application such as, C++, C#, etc. The environment of azure and Windows are much similar. it’s effortless to create a cloud version of a current Windows application. Azure helps to create applications that run reliably and scale from thousand to million users without any additional coding. After developing any application, the developer can specify the number of the processor. With the growing demand and trends, with the help of azure it is very easy to change the setting in cloud to use more platform. The Azure cloud platform allows the developer to decrease the cost of building and expanding over resources. The cost of debugging, creating, distributing and testing web-based applications can be lowered. Because developers need to only pay for the computer processing time and storage space. Security is the important aspect to be considered in the web application development. Keeping security as main consideration azure is designed to provide complete cloud security for companies. The application uses Security Assertion Markup Language (SAML) to determine the user accessibility and. The NET Access Control Service provides way to integrate identities. The organizations using SQL Azure provide, the benefits of an enterprise-class data center without the inconvenience, headaches, and cost of maintaining entity. It allows the organization to obtain availability and reliability of multiple copies of data on automatic failover. Omkarsoft is the Azure Cloud application development company located in Bangalore. We design many outstanding of cloud services depending on the requirement. we also develop mobile apps using Windows Azure services at affordable prices.